I don’t begin with images, not even in my head. When I don’t know where to start, I reach for a pen, and spill out words. Not sentences, just words, and phrases. They seem disjointed but they’re connected, a web of thoughts. A few weeks ago I learned that something scary and wonderful may happen. I might be part of an exhibition. Maybe. If it happens. If they want me. I don’t feel ready. But I’ll never feel ready, so I can’t let that make a difference. Since the possibility emerged, the enormous hole of fear has gradually been mending, patched with fragments of ideas scribbled onto little squares of paper, here and there. This morning I opened a blank sketchbook, pasted in the little squares, scribbled some more, saw where I might go. Worrying that I can’t begin by seeing, looking, drawing, I turn (of course) to a book for reassurance. This is a common way of working for many artists who, for one reason or another, do not find observational drawing a suitable basis for their ideas or thoughts. For many, it would be impossible to draw what they want to express. Creating Sketchbooks for Embroiderers and Textile Artists, Kay Greenlees, Batsford, 2005, 59 – 68. Scraps of paper, crammed with words, building blocks of ideas I need to dwell with, within. Foundations for pieced thoughts. In her comments on my fabric manipulation assignment, my tutor mentioned that when writing about my work I should ‘extend [my] frame of reference to include the work of other artists and craftspersons’ – to show that I’m aware of contemporary and historical textiles and to show how I’m influenced by others. I must admit I sometimes avoid looking outward very far, for fear that I’ll find someone else doing just what I’m doing. I have had that experience once or twice, and I know it’s happened to other people too. I don’t mean copying – I mean that strange phenomenon where several people in far-flung places all start doing the same thing at the same time. So thanks, Julie, for mentioning Alice Kettle’s recent Place Settings series – it set me off on a trail of discovery. Here’s one of Alice Kettle’s collaborative pieces with Helen Felcey. There are more on her website under the ‘New Proj’ heading. I think these pieces are absolutely beautiful, lovely lines that move between the cloth and the ceramics, delicate shimmery spoons and cups set against the scribbly textures of Alice Kettle’s embroidery. A search for place settings in art led me to some other works too. One was Judy Chicago’s famous piece “The Dinner Party“. I had read about this celebration of the lives of women throughout time before, but the power of the web means it’s now accessible in a 3D tour where you can virtually wander round the table. Quite awe-inspiring in its scale and execution, even just on-screen. The second piece I found is a work in progress – also a large-scale installation – weaver Eleanor Pritchard’s Place Setting. This will be at Orleans House Gallery, Twickenham, from 12 June – 26 September 2010. Eleanor Pritchard says the work is ‘essentially a project about dining’ – her guest list includes all kinds of people from aristocrats to nursery maids. 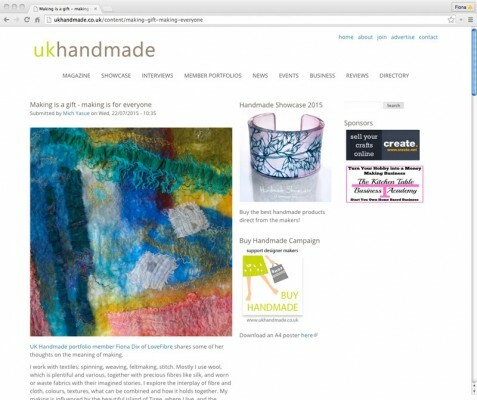 I’m glad I recorded the idea of narrative stitched into napkins in my ‘hospitality’ theme book before I found this site – that originality thing again! One of my ideas for the hospitality piece was to machine embroider the words of asylum seekers, their responses to receiving welcome, as white words on white fabric, ‘hidden away’, ‘revealed in the opening up of a napkin at the beginning of a meal’, ‘hard to read but if you look they are there’. I decided on placemats, not napkins, in the end, and I may not use the writing idea (though it’s still in the mix) but the uncanny similarity of intention remains. Eleanor Pritchard’s embroidered stories are central to her installation and will reflect the lives and narratives of her guests in 24 damask napkins. That is just a part of this work, which I think is going to be amazing and well worth a visit if you are within reach. The last piece I found, which again has some elements in common with my theme, is not a large public work, rather a personal gift, but public nonetheless by virtue of being on Flickr – Samantha‘s lovely, quirky set of 6 ‘mismatched placemats‘ for a wedding anniversary gift. If I tell you I had already decided that my ‘hospitality’ piece would be 6 mismatched placemats and that they would be blue and white, you may guess that I did indeed start to feel a bit worried at this point! In fact the resemblance ends there and is actually quite incidental, but it does show that very few ideas are really unique – however hard you strive to be ‘original’. So I think I’ll stop fretting about that and just enjoy the connections! Speaking of enjoying connections, I occasionally make a Flickr gallery, it’s easy to do and a great way of collecting some lovely and interesting work together in a complementary way. With blue and white very much on my mind, here are two to share with you: blue and white cloth and blue and white cloth 2. I hope they make up for the lack of pictures in this post! 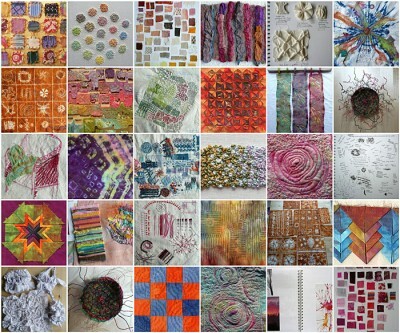 Long ago, when I started this blog, its primary purpose was to track and trace my progress through the Open College of the Arts Textiles 1 course. Which, if I hadn’t moved, I would already have finished; my new deadline of mid-November is looming and I still have half the course to complete so I need to step up a gear. Right now I’m working on producing a textile piece – it can be either a whole or a part of something but the ‘something’ has to exist at least as a design, this isn’t just another sample. I spent yesterday reviewing the work I’ve done in the previous couple of modules – Design, Printing and Painting, and Manipulating Fabrics. There’s a lot of ‘stuff’ and it’s impossible to lay it all out in one place as they suggest: instead I went through it, pulling out anything I really liked the look of or found interesting as an idea, and then ‘collected’ those piece together in Flickr. Apart from looking for potential in the work I’ve done, I’m also interested in how it impacts on other people, whether it inspires, gives pleasure, moves, communicates or challenges. Only comments really give an idea of that, but this next mosaic is made up of the work that Flickr rates most interesting, which they appear to work out from some combination of number of views, number of comments and how often the work is favourited. There is some overlap with my own preferences, but mostly difference – I should think about the implications of that, but not in this post. 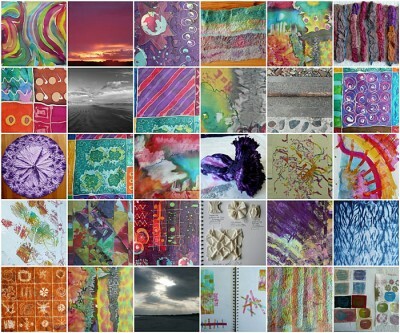 Looking for relationships and themes in the collection of potential work from which to develop a further design, visually I see stripes and edges, borderlands where boundaries are in question, colours merging and glowing, textures combining with pattern, grids and intersections, irregular rhythms and flowing movements, circles, spirals and radials. 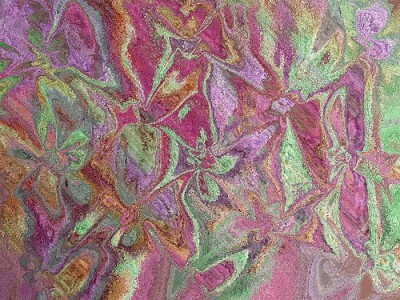 In terms of materials and techniques I see fabric manipulation, felt, silk, wool, cotton, paint and dye, and the traces of stitch. While that’s partly due to the constraints of being asked to choose material from the most recent modules, it fits with where I feel myself to be. Things that I’m not seeing, but would also include, are actual expressive stitch, text, and elements of collage or layering. As for subject matter, well, hmmmm, it almost seems that the surface is the subject? 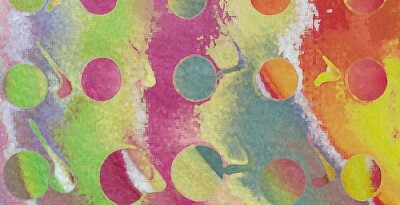 something about the interplay of texture and colour, pattern and shape and light. I note that the work that interests other people is much more varied and includes conceptual and representational work as well. Definitely more food for thought there…. I’ve done a whole lot of playing in Photoshop both with the design source mosaic and with some of the individual images – changing colours, applying filters, wrapping the pixels around displacement maps to create new surfaces. Gathered fabric and shibori make interesting maps to work with and I like the idea of recycling these images of fabric manipulation samples directly back into the design process. I’m ready to start developing the design work into samples now – the ones I may pursue are on Flickr – but here are a couple of them.